In a previous post, I mentioned how important it was for my daughter, Courtney, to accompany me on as many of my road trips as possible. My Ghosts of Ohio “family” got her off to a great start by giving Steph and me a whole basket full of ghostly clothes to dress her in. The biggest thing, of course, was just how well Courtney was going to hold up on the trips. Or if she would even like traveling in the car. 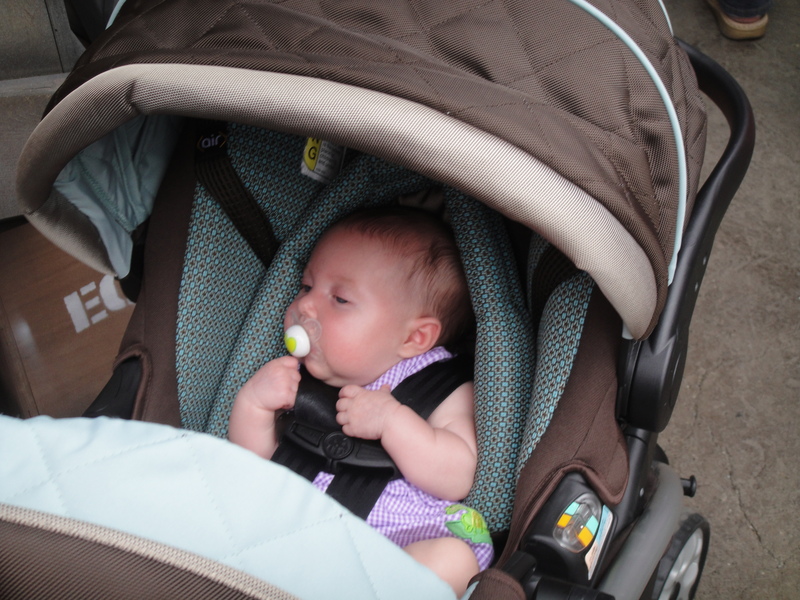 As far as traveling in the car, based on what all our friends told us, babies all love being in the car. We even have friends who, when their kids won’t go to sleep, will put their child in a car seat and drive around the neighborhood until 3:00 am until they finally fall asleep. Still, I think Steph and I were both a bit apprehensive about how Courtney would react. We’ve started Courtney out slow and so far, so good. She seems to love driving in the car and if she’s not out cold in the first 5 minutes, she just chills out and watches the scenery go by. To date, Courtney has survived rides to Kroger, Target, and even several trips to the Salvation Army to drop off donations. She even graduated to being able to venture inside Some of the locations, namely Kroger and Target. We’re thinking perhaps a weekend trip to the Columbus Zoo this weekend might help prep her (and her parents) for the longer trips that will begin in early August. Until then, I’m proudly working on adding Baby On Board stickers to my car and we’ve decided that a good rule of thumb will be to double the length of time we’re estimating it will take to get to a place. Anything else we should know? Shoot me a comment!